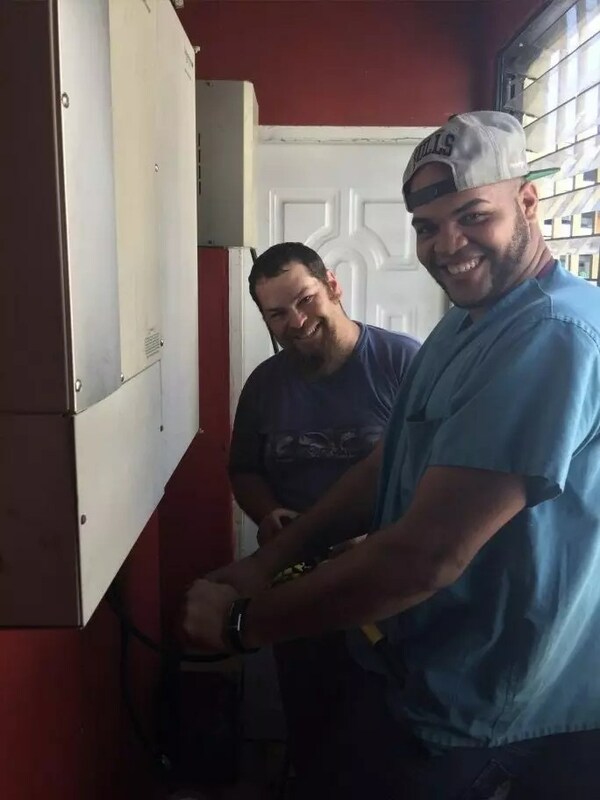 Peter Schug and I were off to Santo Domingo, Dominican Republic to work at the Cure International Hospital near the colonial district. After making all the cultural connections after arriving on Monday morning, we got down to the tasks at hand. Moving the vacuum pump was no problem but fitting it into the new space presented some challenges. We ended up cutting the counter top and a piece of the mounting foot. It turned out to be a press fit but it is in place correctly. We developed a materials list for the electrical and piping fittings in moving the vacuum pump. I tried with examples to describe what I needed in very rusty Spanish but something is always lost in the translation. Not only did he purchase quantities different than requested but some unusual twists on parts. We finally had to laugh with him on the purchases. Our national contacts here realized with a little encouragement that Peter and I needed to go on the shopping trip. As we were at the large LOWE’S in the DR called Unidos, we had to change design several times based on items available. I must admit they had an awesome selection of items. It was a painfully slow process as we had to interface with several departments in the store but in the end, it all worked. On our return, it became painfully obvious that the plastic PVC conduit we had on hand did not fit with the metal pieces we purchased. I tried heating the conduit and reforming it but it was so thin it did not conform to new shapes. I then tried slotting the conduit and it was moderately ok but not very elegant. We proceeded with as much enthusiasm as possible. The plumbing aspect went ok though. We carefully checked over the wiring and then turned on the vacuum pump. It worked well and shut off at 25 IN Hg. My brief celebration was short-lived. I opened the valve to the ORs and the pump would not shutoff. It did not have enough capacity to overcome a massive leak in the piping downstream. I checked all my connections and I could not identify a problem. Well, Sandra who is the head nurse of the OR area said the vacuum was a little bit better but….I got changed into scrubs and went into the OR area. 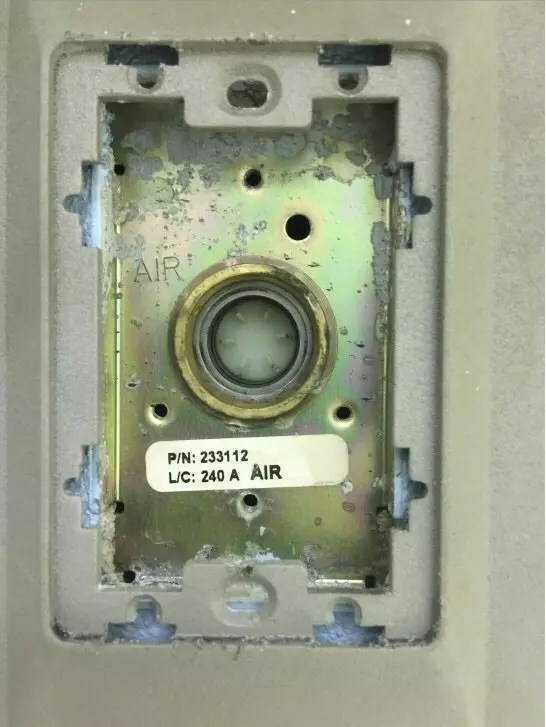 When I removed the vacuum outlet it suddenly dawned on me that the cleaning procedure with bleach water had nearly destroyed the electrical outlets and the oxygen and vacuum outlets were badly corroded. Normally, the medical gas outlets and backbody are a matched pair. When you remove a front outlet the valve in the back body or receiver shuts off the gas. Not so if one uses a Medical Air backbody and a Vacuum outlet. The gas is going the wrong way thus the valve never closes! The persons who installed the piped gas system used the wrong backbodies on both the vacuum and oxygen systems. Everything “LEAKS.” Soooooooo, the combination of wrong parts installed incorrectly, small diameter piping, directional valves installed backwards by a previous national contractor had left them a system that underperforms to say the least. The maintenance staff of Cure removed the old batteries and corroded metal structure. They had fabricated a new metal base and we drilled for new anchors. The corrosion ate up the paint on the wall so I took a wire brush and removed the damaged paint. I asked them to paint and they brought Red Lead paint. Not sure what took place in the translation but I ended up operating the paint brush!?!?! 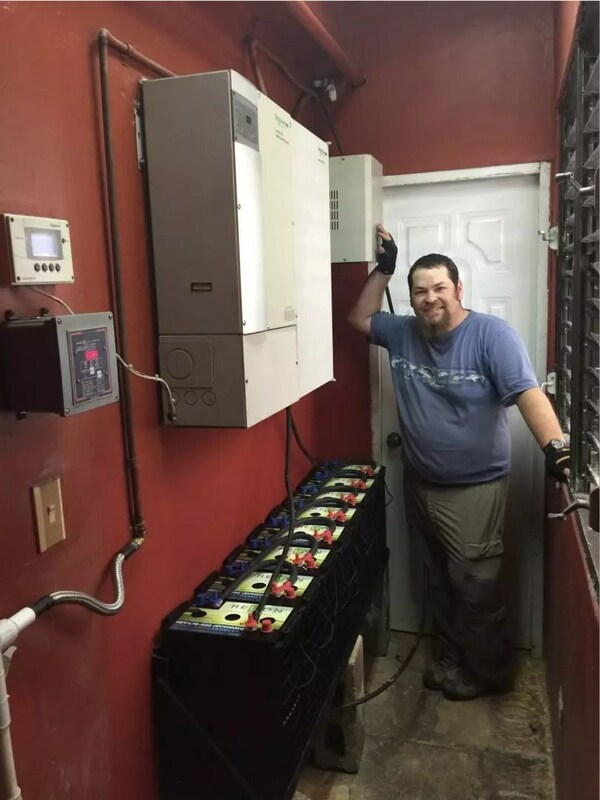 We installed the batteries in the Schneider inverter system. Each battery weighs about 100 LBs each and there is 8 of them. We tested each battery and they all looked ok.
After installing all the battery jumpers, it was time to turn it on. After a couple of parameter changes, the inverter booted up ok and synced with the GRID input and started charging the batteries. Brief celebration! Whilst I was in the OR, Sandra mentioned one of the surgery lights was not working. Sure why not? They repeatedly said the bulb was ok but when I asked how to remove it to check it, all of the eyes rolled up or looked away. We figured out quickly how to remove the bulb. It actually looked ok but with a meter is was Toast. You always get in trouble asking too many questions like “what happened?” Well, it was said that the transformer for the surgery light had been changed? My Spanish failed me in the translation of why. Nevertheless, the replacement transformer did not match the characteristics of the bulb causing the bulb to fail. We purchased and installed a new dimmer switch on the OR light to preserve the bulbs. The biggest challenge of the trip turned out to be drilling a 1” hole through a concrete column filled with 3⁄4” rebar. 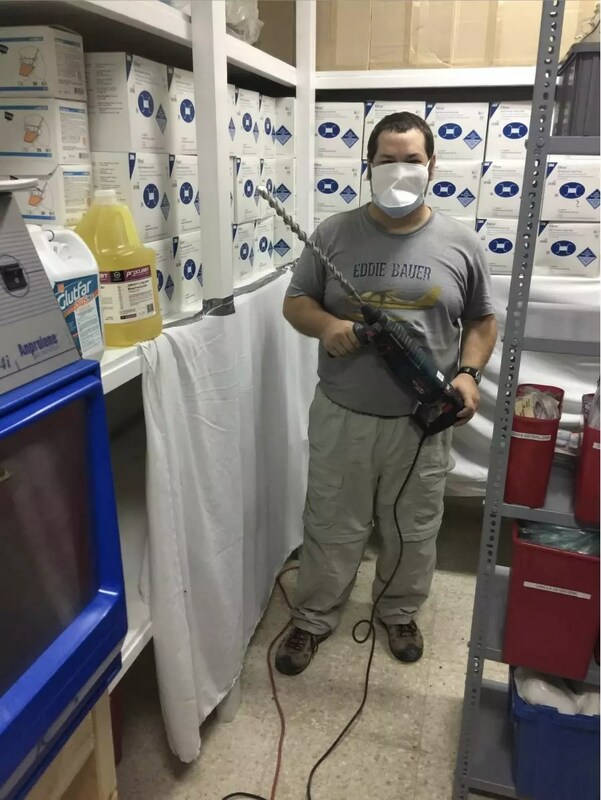 The hole was necessary to pass the 1”’ hose on the exhaust of the Ethylene Oxide Sterilizer to the outdoors. Even through the output filter on the machine absorbs the 99% ethylene oxide gas, the machine still needs to be exhausted outside. Peter worked in a very confined space in the “clean” storage for nearly an hour drilling the hole. After finishing up all the hose connections, I ran the ethylene oxide sterilizer through a cycle without the chemical just to make very sure all the working components functioned. In the afternoon, the entire staff gathered around me to do a real cycle with the ethylene oxide. I must admit I was a bit scared. The training went fine and we activated the chemical, locked the door of the sterilizer, and then locked the room door for security. The cycle me is 12 hours so we will verify proper operation the next morning. 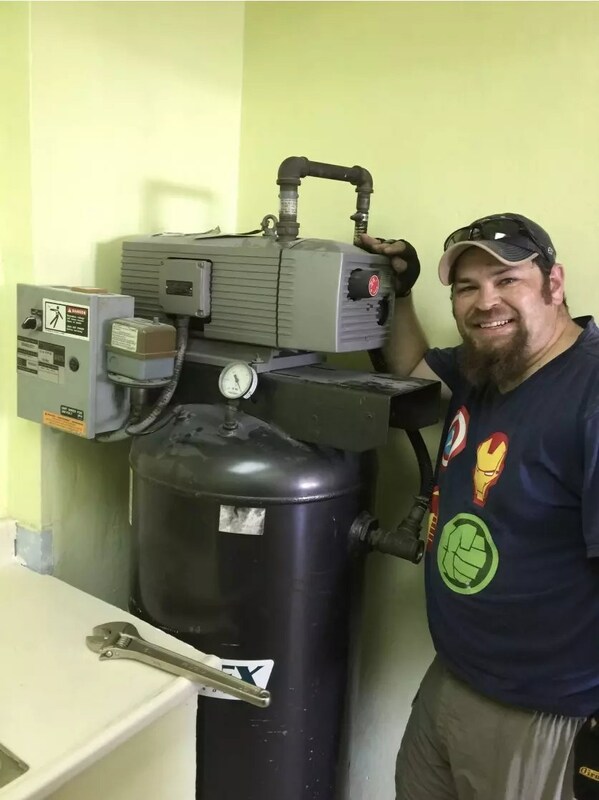 The ethylene oxide sterilizer worked perfectly and we worked with the staff to reload it for a weekend run. I totally forgot to report on Thursday mornings activities. When we first arrived, I was told there was only a partial image in the x-ray images. I told them I would stop by in a while and see what was happening. A few minutes later, I stopped by and all was ok but I was handed a small piece lead was removed from the Collimator. Strange? Well, we purchased some contact cement so it was the project. I found out where it became detached, disassembled the Collimator and glued the piece back on. It all went well. Next I brought a hand exposure switch and we installed that. Testing the new switch allowed me to check system calibration. It was all good.